Diabetic retinopathy falls into two main classes: nonproliferative and proliferative. The word "proliferative" refers to whether or not there is neovascularization (abnormal blood vessel growth) in the retinaEarly disease without neovascularization is called nonproliferative diabetic retinopathy (NPDR). As the disease progresses, it may evolve into proliferative diabetic retinopathy (PDR), which is defined by the presence of neovascularization and has a greater potential for serious visual consequences. NPDR – Hyperglycemia results in damage to retinal capillaries. This weakens the capillary walls and results in small outpouchings of the vessel lumens, known as microaneurysms. Microaneurysms eventually rupture to form hemorrhages deep within the retina, confined by the internal limiting membrane (ILM). Because of their dot-like appearance, they are called "dot-and-blot" hemorrhages. The weakened vessels also become leaky, causing fluid to seep into the retina. Fluid deposition under the macula, or macular edema, interferes with the macula's normal function and is a common cause of vision loss in those with DR. Resolution of fluid lakes can leave behind sediment, similar to a receding river after a flood. This sediment is composed of lipid byproducts and appears as waxy, yellow deposits called hard exudates. As NPDR progresses, the affected vessels eventually become obstructed. This obstruction may cause infarction of the nerve fiber layer, resulting in fluffy, white patches called cotton wool spots (CWS). Early NPDR – At least one microaneurysm present on retinal exam. Moderate NPDR – Characterized by multiple microaneurysms, dot-and-blot hemorrhages, venous beading, and/or cotton wool spots. 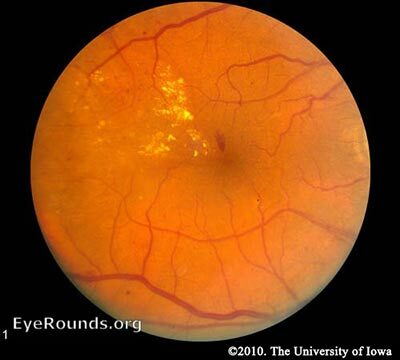 Severe NPDR – In the most severe stage of NPDR, you will find cotton wool spots, venous beading, and severe intraretinal microvascular abnormalities (IRMA). It is diagnosed using the "4-2-1 rule." 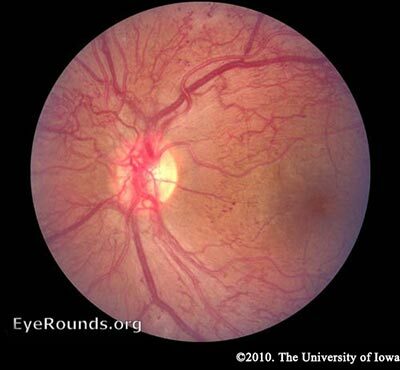 A diagnosis is made if the patient has any of the following: diffuse intraretinal hemorrhages and microaneurysms in 4 quadrants, venous beading in ≥2 quadrants, or IRMA in ≥1 quadrant. Within one year, 52-75% of patients falling into this category will progress to PDR (Aiello 2003). PDR – As mentioned earlier, the retina has a high metabolic requirement, so with continued ischemia, retinal cells respond by releasing angiogenic signals such as vascular endothelial growth factor (VEGF). Angiogenic factors, like VEGF, stimulate growth of new retinal blood vessels to bypass the damaged vessels. This is referred to as neovascularization. In PDR, the fibrovascular proliferation extends beyond the ILM. This may sound like a good idea, but the new vessels are leaky, fragile, and often misdirected. They may even grow off the retina and into the vitreous. As the vitreous shrinks with age, it pulls on these fragile vessels and can cause them to tear, resulting in a vitreous hemorrhage and sudden vision loss. These vessels may also scar down, forming strong anchors between the retina and vitreous causing traction on the retina. If enough force is created, a tractional retinal detachment may occur. This is another mechanism by which DR can cause sudden vision loss. If the retina is not re-attached soon, especially if the macula is involved, vision may be permanently compromised. While the effects of neovascularization in PDR can be devastating, the most common cause of vision loss in diabetics is macular edema. Macular edema can occur in NPDR, but it is more common in more severe cases of DR due to the leakiness of the new blood vessels (Wani 2003). Diabetics can also have problems located more anteriorly in the eye. The angiogenic molecules that are produced by the retina may float anteriorly, causing neovascularization of the iris. These vessels can grow into the angle of the anterior chamber where the trabecular meshwork, the drain of the eye, resides. This can obstruct outflow of aqueous fluid, raising intraocular pressure and causing acute glaucoma.